Tonight is the NBA Draft. Realistically, the only MAC players with a shot to be drafted are Zeke Marshall and DJ Cooper. The Pistons did work A'uston Calhoun out, however. They have two second round picks. Don't know if that was a local flavor move or what...they also worked out a UD player...Calhoun certainly has pro potential overseas if that is what he wants. And yes, the Pistons misspelled his first name. If you wonder what Omar Jacobs might be up to, he is the QB for the Wichita Falls Nighthawks, who won the Professional American Football League title this year. (Wichita Falls is in Texas). Isaiah Gourdine played in the East-West All-Star game sponsored by the Michigan High School Football Coaches Association. This article features a nice profile of him as he talks about his philosophy for the game. His team, the East, won 20-3. The Football team has its 11th verbal for the class of '14. He's another Ohio boy and the first DB in this year's class...Nick Johnson of Canton Timken. He was an all-around player who threw 81 passes, had 15 receptions and 56 carries....and that's on offense. On defense, he had 4 INT. The Internet tells us he is being recruited as a d-back. He also was a highly successful player on their basketball team that made a big state tournament run and ran an 11.09 in the 100M and 22.39 in the 200M this spring. He's nicely sized for a rising senior (6'1" and 170) but our coaches have recruited an outstanding d-backfield and this young man looks like quite an athlete. Look forward to seeing him sign and play in orange and brown. BG has two new football verbals reported, bringing the total to 10 for the year. This is well ahead of last year's pace. BG did not pick up its 10th verbal last year until August 4, based on what we see on the internet. Last year, BG was recruiting for what was expected to be a small class (and ended up being big-ish) and now is recruiting for what is going to need to be a big class. The first player is Andrew Podbielski, who is a TE from Beaver Falls, PA. Good football country there. In fact, Beaver Falls is the home of a guy named Joe Namath. He's 6'5" and 230, which is really nice size for a TE. I'm guessing he's somebody we are looking to provide a physical presence on blocking downs. As a junior, he made 14 catches for 199 yards and two touchdowns. Here's the good part--he also made 50 tackles playing on the defensive line. In the meantime, welcome to the Falcons Andrew and Griff. No secret here, I love Phil Steele. His football preview is the best available....remember when you used to get your Street and Smith's and you'd go to your favorite team and you'd have 50 words about BG and most of it was about a guy who transferred four months before? Not Phil. Dude is on top of it....his magazine is JAM-PACKED with information....and I highly recommend that you grab a copy. He likes our Falcons this year. BG has the elements he looks for in a team...namely, experience (BG is 5th in the nation in experience) and an experienced QB that he projects to be #6 in the MAC, which is pretty fair. He puts us first in the East, #2 in the MAC, #45 in the nation and #63 in the power poll, that is schedule agnostic. He believes we will have the #115 ranked schedule. In terms of the position category, he has us ranked #1 or #2 at all the defensive positions and #3 on the Oline. The trouble areas are RB (#9) and WR (#6). Special teams are #3. I think these are all pretty fair. I think the defense will be really good again. Having said that, I think that the difference between a good year and great year for the team is going to come on offense. The team finally has experience and ability up front but question marks at the skill positions. Steele feels that Schilz will be back to his sophomore numbers, which accounts for him being up to #6 in the MAC. At RB, he notes that Samuel is a question mark as is Givens. If they are both back and productive I don't think we are #9 and it would make a huge difference. He looks for the WRs to get better with experience. So here's the thing. You really worry about RB. BG at times last year was one-dimensional and if the team can't run the ball, they will be un-dimensional. With Samuel and Givens, with Hopgood and Martin back from injury, you could be pretty deep. Otherwise, you start to dip into the four true freshman who came in. Either way, it is vital for BG to have a solid running game and it is a question mark right now. WR is similar. Gehrig Dieter is petitioning to play, that would help a lot. BG's receivers have to get better. There is talent but they need to be open. With all that--a line, a running game, and WRs, I think Schilz can be productive at QB. However, without those elements--especially on the ground--and we're going to need shutouts from the defense to win. Anyway, mostly in BG we have a culture of high expectations for the first time in years. I think that last time anyone thought BG was going to win a division was in the early Brandon years. If we have to beat out OU we have them at home to end the year...he's expecting Buffalo to surprise, Kent to fall back and Miami, Akron and UMass to struggle. I think Coach Clawson has done a great job rebuilding the wreckage and getting us where we are today. 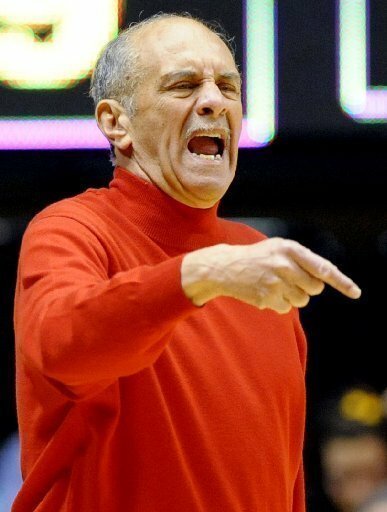 Now, we need to see him take us one more level and win a MAC title. People will be expecting big things. Ladies and gentlemen, Happy Phil Steele Day! The Book the Experts Cannot Do Without is on the stands today and places our BG Falcons on top of the East. BG places second in overall power rankings in the conference. We'll have more later, but this only heightens the anticipation for August 29. It is only a prediction, but this is a team that finally has a ton of experience and ability. Expectations are high...which is the way you want it. Pairing are out for the Cancun Challenge....yeah...well, stateside BG has two really tough assignments, playing @Wisconsin and @St. Louis. Once we get out of the country, it could get better. We play Presbyterian, who was 8-24 last year and among the 20 lowest ranked teams in the US, according to kenpom.com. The internet is reporting that Thomas Jones of Harper Woods Chandler Park Academy has verballed to BG. Harper Woods is on I-94 north of Detroit, about halfway to St. Clair Shores. Chandler Park is a charter school sponsored by Saginaw Valley State...they were 5-4 last year, playing in the Michigan Charter School League. Honestly, I tell you all this to kill time because I cannot find very much info on this young man. He's project to play inside LB ("Mike") and he's 6'1" and 230 pounds. Beyond that, I don't have very much. If anyone else knows more, please put something in the comments. The APR reports are out today and they are very good news for the Falcons. You can check out the full BGSU release here, which I have no intention of doing anything but highlighting. Suffice it to say that BG is strong across the board, at single-year perfect levels in eleven sports. All of the Falcons' 18 sports have multi-year APR rates of 940 or above and 11 posted a perfect 1000 single-year rate in the latest report for the 2011-12 year. As well, 11 teams posted their best multi-year score since the APR began in 2004-05. All 18 of BGSU's teams were comfortably above the NCAA's minimum score of 900 to receive scholarship limitations or postseason bans. The women's tennis, women's golf and swimming programs at Bowling Green have the highest APR scores in the Mid-American Conference for their respective sports. Make sure you mark this in the Greg Christopher legacy, by the way. It isn't a matter of trading winning for academics or academics for winning. In the MAC, you should be able to do both. We want BG to win and we want them to do it in a way that we can be proud of. Lots of credit to all the people who work on this--coaches, support staff and athletes alike. It is a good day to be a Falcon. Kingston on UT: "We're gonna beat 'em." There is nothing like the introductory press conference. The unblemished sense of possibility...the purposeful stride to the podium...the flinty gaze...the hat (in this case worn for a second but no more)....how could you not love it? Are we not human? 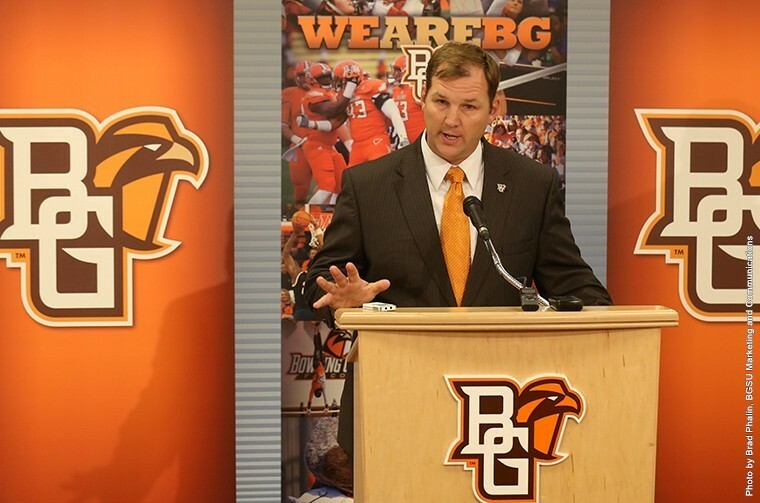 Chris Kingston introduced himself to the Falcon Nation today as BG's 13th Athletic Director. He talked wistfully about his mentors, thanked his wife, etc. And then he got into the kind of talk that landed him the job. There was one part--dropped softly into his 2nd element of success--that to me said everything about the challenge he faces. I wrote yesterday that BG's current funding of athletics is lagging. Until that is addressed, the kind of winning we all seek is going to be hit and miss. 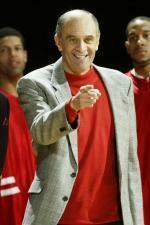 "Our goal will be to reach the average operating budget in the Mid-American Conference. Given [our strengths] we will overachieve by reaching the average operating budget in the MAC." That is a bigger goal than it seems like. So, a couple of observations. First, BG is the lowest spending time in the MAC. Second, the MAC average is $24,653,563, which means that BG is about $6.3M and change below THE AVERAGE. The Falcons would need to increase spending by 34% to reach average, and that's assuming the target stays stable between now and whenever we think we can get this done. In actuality, we have to go 34% ahead of whatever the inflation is. Where will the money come from? Well, it will be tough to get it from students....BG is just below the MAC average currently. "There are a number of ways we will accomplish this--through new and existing partnerships and I can tell you from experience it is a formula that works." He talked to Bill Frack for 45 minutes and feels like he has a friend for life. Which he probably does. He had lunch at Myles Pizza...good start, tough to make tomorrow that good. He thanks Debbie Yow...not judging...but eesh. "Everyday is a game day for an administrator." "Three components are the formula for success: people, resources, opportunities." The sky is not the limit---phrase copyrighted by his daughter Lakin. It sounds like we flew his family up on a private plane, courtesy Wilcox and Sebo. He talked about hockey, even with a verbal typo on what WCHA stands for. He said "Roll Along." There was applause. He was a photographer at SeaWorld (while in college). "We're cresting the hill here at BG." (Military talk). He was asked about the Army-Navy rivalry and to compare it to BG-Toledo. Referring to the Rockets, he named a bunch of sports and said, "it doesn't matter what it's in, we're gonna beat 'em." BOOM, BABY! That's what I'm talking about. Oohhh yeah. Seriously, he was well prepared, referenced a lot of stuff that you would only know if you had spent time getting ready. At the start, what matters is how you understand the challenge. At BG, it is to transition from facilities to operations and winning. Facilities are now an asset and the next AD has to bring it home with championships while preserving our program's integrity and academic stability. Whether he succeeds or not is still to be determined, as it is for everyone. We're behind him 100%. The Blade is online today with the news that BG's new athletic director will be Chris Kingston, who is the Executive senior associate director of athletics. Kingston is directly responsible for the day-to-day operations of the football and men's basketball programs. Additionally, he oversees external initiatives, athletic branding and multimedia rights. Other areas of supervision include NCAA compliance, student services and media relations. He serves as the athletics department's liaison to the Wolfpack Club and serves on the Intercollegiate Athletics Cabinet. I say that because of his focus on main sports and the fact that he is not primarily a fundraiser, a criticism (if unfair) of Greg Christopher. 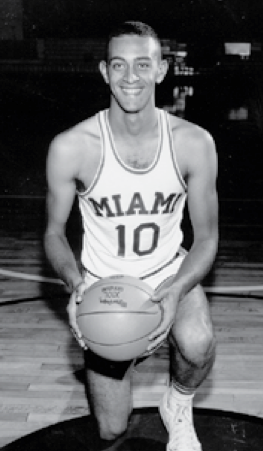 Having said that, he did serve a significant role in athletic fundraising at West Point. Like it or not, the Athletic Director has to be able to raise money in this environment. He got his undergraduate degree at Central Florida, but we're going to look past that for now. 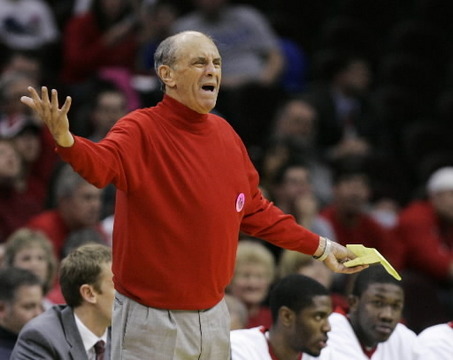 He was only at NC State for about 2.5 years, as well. Looking around the BGSU sports environment, I would say the two biggest opportunities for improvement are men's basketball and hockey. You'd like to think he has the background in the former...Falcon hockey fans may be nervous about his lack of background in the latter. But, who are you going to find who is an expert in everything already? If he's good, he will figure it out. He has some tough hurdles to overcome. BG's athletics lag behind other teams in terms of funding, and beyond women's basketball, none of the major revenue programs have had significant conference-title success in a long time. That's a good thing from the perspective of an opportunity to show your stuff, but it isn't going to be easy. You never know on these things. On paper, he looks like a very promising candidate, and I look forward to hearing what his priorities are when he is introduced on campus. News just in, Charlie Coles has died. I poked a lot of fun at Charlie over the years--nicknaming him the "Evil Genius"--but that was only because he was just the best and most entertaining character I had seen in a world of cookie-cutters. He was an original and he will be missed. I wrote the post below when he "slipped the surly bonds of the Mid-American Conference" and now that he has "slipped the surly bonds of earth" I reiterate everything I said. He left like King Lear, raging. He did not go quietly. He thrashed and twisted as he left the stage. They had to drag him off, and you know, in an odd way, you gotta respect that. The world has plenty of places for people who accept their fate. 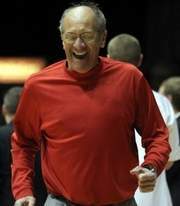 He is the winningest coach in the history of the MAC. (When he hugged a clearly horrified Bob Nichols after breaking his record, Coles set a MAC record for causing discomfort in an old white man.). 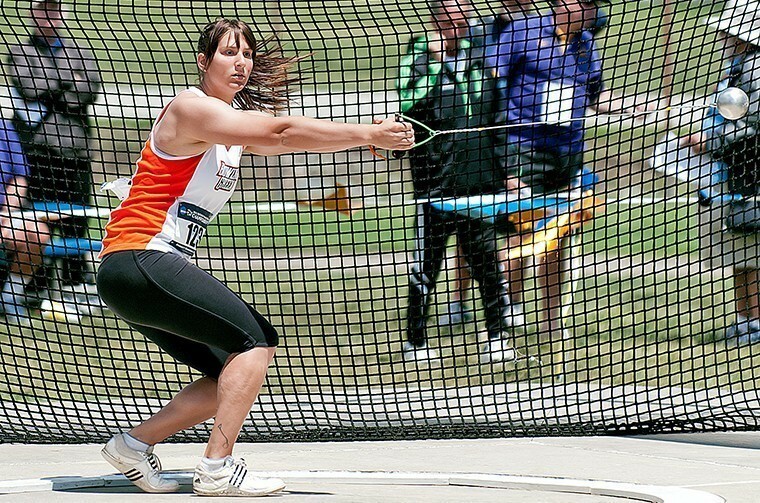 On the top of the MAC Baseball champions, BG has an individual champion in track and field, as Brooke Pleger (of Saline, MI, where I live) won the MAC Hammer Throw Championship and then today finished #7 in the NCAA meet in Eugene, OR. That makes her first team All-American, making her BG's second first teamer this year (joining Chris Jones). Only two Falcons have ever finished higher at the national championships than Pleger did. In 1998, Huina Han finished sixth in the triple jump and Beth Manson placed sixth in the discus in 1989. The last BGSU student-athlete to score at the meet was Stephanie Heldt, who tied for seventh in the high jump in 2001. She has also qualified for the USA Track and Field Championships coming up in June. She's just a redshirt sophomore, so she has two more years in orange and brown ahead of her. Great job Brooke! The Falcon Nation is proud of you. Just catching up on some news from the Falcon Nation during the summer....this came out a few weeks ago. The men's basketball team will play in the Cancun Challenge. The tournament has eight teams. There are two initial games in the US and then all eight teams go to Mexico to finish the tournament. (The games BG plays in the US will be away). 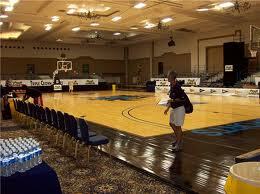 What makes the tournament unique is that the floor is assembled inside a ballroom, giving a highly unique look to the whole thing. Last year, three people mistakenly walked in looking for a realtor CLE seminar. Or, I made that up. The eight teams are broken into two divisions: the Riviera Division features Old Dominion, St. Louis, West Virginia and Wisconsin and the Mayan Division will include Bowling Green, Georgia Southern, Oral Roberts and Presbyterian. So, we're in the right division. BGSUfalcons.com has travel info for anyone looking to spend Thanksgiving in Mexico. The football team has a 7th reported verbal, per espn.com. His name is Tyler King, and is a d-lineman from Lakewood St. Ed. He's 6'3" and 265 pounds and had offers from six other MAC schools. Cleveland.com had this to say about him in February. Agile, spins well, does nice things on film that line coaches love. Big Ten schools taking a close look. This is a big-time HS football program that went undefeated in the regular season last year before losing to Mentor in the state tournament. (Mentor lost to Whitmer in the next round). Can't find a lot more on him, but he was well recruited and coming from that program--that puts multiple players in D1 every year--this looks like it could be a great get for the interior of our D-line. He is the 4th defender and second d-lineman in our seven verbals. The MAC Champs fell again, today to Oklahoma State in Louisville. BG had its chances, but just made too many mistakes to beat a very good Cowboy team. They're champions, and we're proud of the way they ended their season. It will be great to see if they can build on this and bring around a new era for the program. 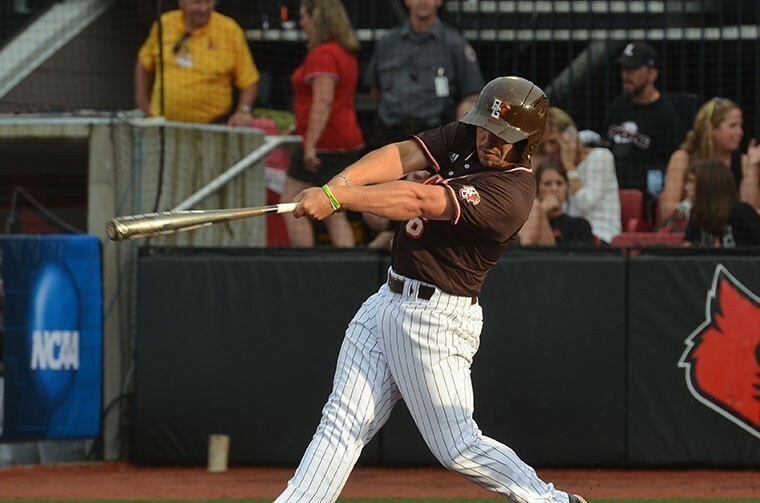 BG had a decent start against Louisville last night but eventually made too many mistakes and lost to the host Cardinals--8-3. They play Oklahoma State at noon today. Still proud of our MAC Champs, hope they can regroup and take the Cowboys out.